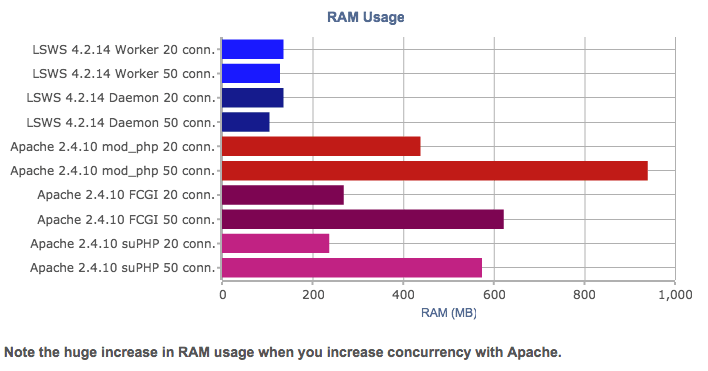 These benchmarks from cPanel Conference 2014 demonstrate RAM usage and server load differences for LiteSpeed Web Server vs. Apache. But Tristan Wallace, cPanel’s PHP guru, wanted benchmarks that would look more like something a cPanel user might be running. For cPanel Conference this year, she tested the difference LSWS would make on a WordPress + cPanel installation, looking at not only speed, but also RAM and load. 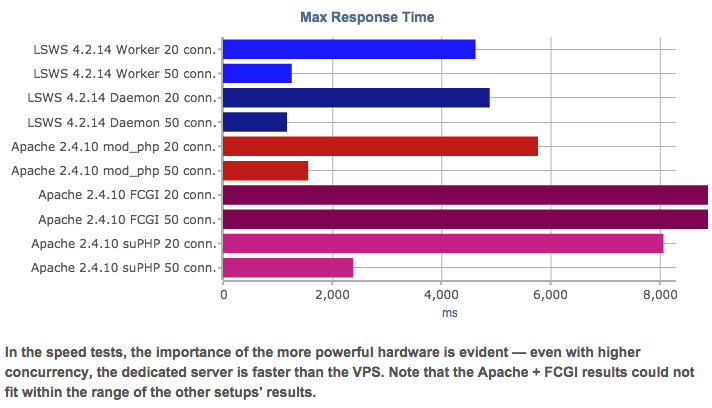 Tristan’s benchmarks (above and below) look at LSWS and Apache at two levels of concurrency. They show a stark difference in scalability. 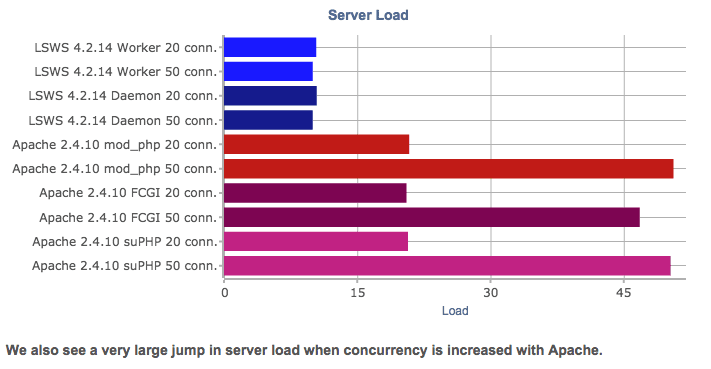 When the number of concurrent connections was increased (from 20 to 50), Apache’s RAM usage and server load exploded. For LSWS, it remained virtually unchanged. This is the main point of LiteSpeed: It cuts load on high traffic servers. . It allows you to serve more traffic (or host more accounts) without upgrading your server. Unfortunately, the two different concurrency levels were tested on separate machines — a small VPS for 20 concurrent connections and a dedicated server for 50 concurrent connections. The reason this was done, though, just underscores the points above: when Tristan tried to run the higher concurrency test on the VPS, Apache just couldn’t handle. LiteSpeed Web Server, on the other hand, it just kept chugging along. This difference in hardware means, though, that the speed benchmark (looking at max response time) doesn’t give us a good picture of what happens to speed when concurrency is increased. We do see that LSWS is faster than Apache (especially for Apache’s FCGI and suPHP setups), but the real difference happens when there’s a traffic spike and Apache can’t handle the traffic. These benchmarks are perhaps not perfect (What benchmarks are? ), but they shine light on an important real world problem: What happens when Apache gets too much traffic. The full presentation and more notes are available on our site. We’ve created a thread on our forum to discuss these benchmarks and we welcome any feedback you may have. The load generated on LiteSpeed and Nginx are around the same, but LiteSpeed can handle around 2x’s the transaction volume that Nginx can at a given server load. It also does not get much easier than installing LiteSpeed on a cPanel server. The whole process should take you around 20 minutes maximum. I am on Godaddy’s shared web hosting services but would like to use LiteSpeed instead of Apache. Is there any way I can do it. Does Godaddy supports LiteSpeed. I am really impressed with the results you posted in this article. I just started using Litespeed instead of Apache on my Knownhost domain. My website is run on WordPress and I was recommended to use the Litespeed WordPress PURGE plugin. However, it is out of date. Any chance you will be updating it to be optimized with WordPress 4.0+? Sorry I forgot to respond to this. Have you tried using the plugin with WordPress 4? I’m not quite sure when we’ll have time to look into this. Hi, my new website is based on server using litespeed and i’m so happy with new speed : ) tnx. Wouldnt the type of wordpress content make a difference too? I mean there is the dynamic aspect and also the static aspect, (php and images, respectively) but I guess there is a fine difference between the “real world” and benchmarks (I will definitely look more into the case studies). However my question, I guess relates to how they compare between delivering dynamic verse static (static can be compressed before hand too)? I am researching it, but it be great if you had some resources I can look into. The type of WordPress site would certainly make a difference. As you noted, though, that would be moving from a benchmark to a case study. Since everyone has different sites, there is no one right setup to test in a benchmark. These benchmarks, though, are “pure” benchmarks in the sense that they are not meant to mirror the real world. The files being served are extremely small to emphasize the differences between web servers. In real life, when serving PHP, a large part of the page load time will be the PHP engine creating the dynamic content. This is why you see a much smaller difference in speed in the WordPress benchmarks. The differences seen in the above benchmark represent differences in speed communicating with the PHP engine. The engine itself is not changed. The static differences in the benchmarks above, though, should be preserved in real life, since the web server actually retrieves the static content.